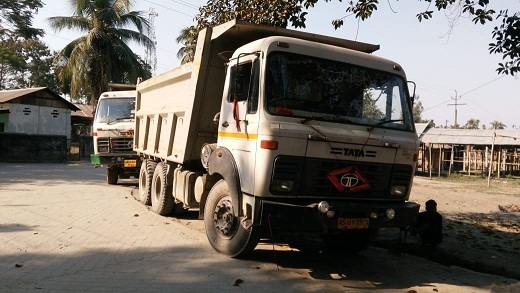 The forest officials under Dhansiri Forest Division in Udalguri in a joint operation with Tangla police seized three dumpers at Tangla town for carrying illegally mined stones, sands from the rivers of Indo-Bhutan border areas of Udalguri on Monday. This has exposed the running of a syndicate of stone and sand in the area. It has been alleged that the syndicate is being run by a section of unscrupulous contractors and businessmen from Guwahati, Mangaldai and Tangla, who supply stones and sands for construction purposes across the State. The Tangla Forest Beat Office and Paneri Forest Beat Office officials along with a team of Tangla police of Udalguri district impounded three dumpers bearing registration no. AS13C5542, AS01FC8973 and AS13C5342 belonging to Prabhu Agarwalla Construction Private Limited. The trucks were carrying the stones and sands through the Mangaldai-Bhutiachang road. Sources divulged that the trucks and dumpers of politically-backed businessmen allegedly manage multiple trips with a single challan and carry excess load than the permitted loads making huge revenue loss to the government. There have also been reports of multiple road accidents and deaths owing to such over-loaded vehicles which sometimes lose control on the road resulting in fatal mishaps. The dubious role of the district administration, district transport office personnel, forest officials have largely been questioned by the conscious circles.